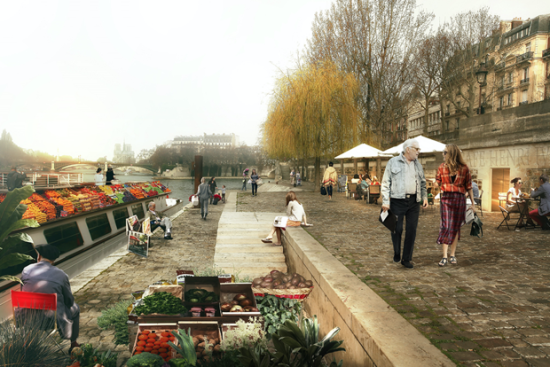 In keeping with Paris’ mounting aversion to automobiles, Mayor Anne Hidalgo recently announced plans to bar motorists from the banks of the River Seine by summer 2016. This latest blow to motorists occurs in tandem with the all-or-nothing anti-pollution target Hidalgo set last year of banning all non-electric or hybrid vehicles from Paris’ most polluted streets by 2020. Renderings for the futuristic River Seine project a motor-free parkland consisting of a tree-shaded promenade with space for children’s playgrounds and sports facilities. The length of this promenade is TBD, with some proposals occupying a modest 0.9 miles, while others insist on a 2.05-mile car-free quayside, potentially freeing up 1.4 acres of parkland. The Seine has a distinctive double-tiered embankment that has allowed it to moonlight as a motorists’ artery into the city center without detracting from the romance of the riverscape. The upper embankment sits at street level, and has remained a scenic promenade dotted with quaint booksellers’ stalls. The lower embankment, where the roads traverse, is at water level and is sunken below high walls, with sections of road encased in tunnels. 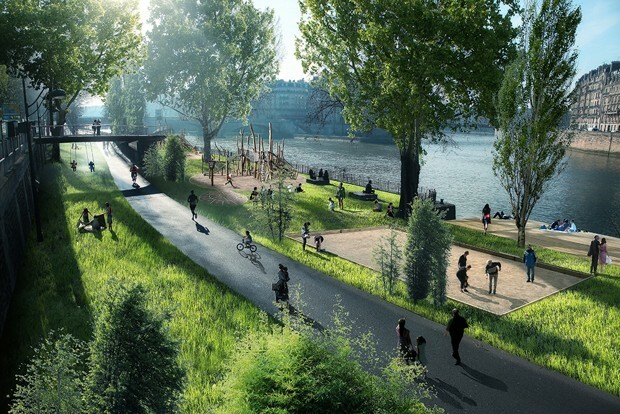 The City of Paris began reclaiming the Seine in 2002 under the “Paris Plages” program, when it closed down sections of the quayside to create a temporary summer beach complete with real sand and sun loungers. In 2013, the city barred cars permanently from a long stretch of the Left Bank to create a waterside park. 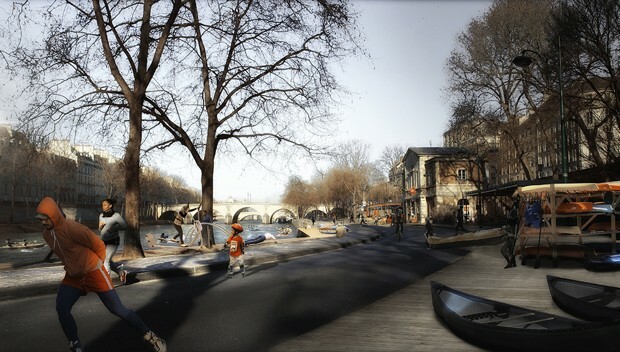 According to the mayor, the city’s slow assail on motorways is part of “an urban, almost philosophical project which consists of seeing the city in another way than through the use of cars.” In Hidalgo’s car-cutting schemes along the Seine are also architected toward freeing up the Georges Pompidou Highway on the North side, part of a UNESCO World Heritage Site.